A software update is now available that introduces new features and adjustments to enhance the overall experience. Please start the game while your Wii U console is connected to the Internet to update the software. The software version after this update will be 1.2.0, as shown in the images below. Adds a new "Transfer on Launch" feature, which allows users with a registered Fit Meter to transfer Fit Meter data immediately after starting the software. After this transfer is complete, users can access their data directly. This feature can be turned on or off within User Settings → Privacy. 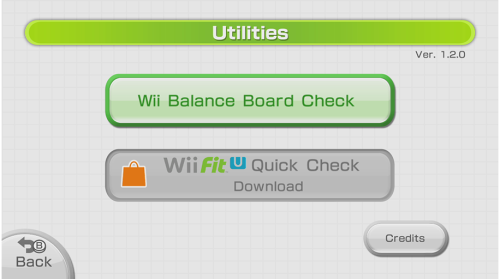 Adds the ability to post screenshots of the Fit Meter Data screen to Miiverse, from the HOME Menu. Even with software purchased after the update was released, you will be required to download and install the latest update accordingly using the above method. 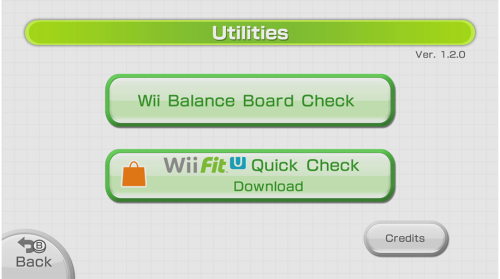 Wii Fit U Quick Check is a downloadable software title that lets you take your Body Test even when the Wii Fit U disc isn't inserted in the Wii U console. 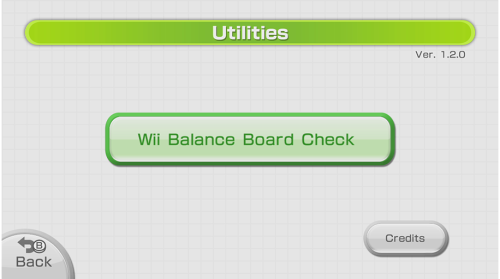 As the Wii Fit U Trial Version and paid downloadable version of Wii Fit U can be played without the need for a disc, they don't require the Wii Fit U Quick Check software.